[SatNews] Thales Alenia Space has been selected by French space agency CNES (Centre National d’Etudes Spatiales) to build the oceanography satellite SWOT (Surface Water and Ocean Topography). Produced in collaboration with U.S. space agency NASA's Jet Propulsion Laboratory (JPL) on behalf of the French and American space agencies, SWOT is an oceanography program that will demonstrate new applications, and is a follow-on to the Jason-1, 2 and 3 operational missions. It will incorporate unprecedented technological innovations in altimetry. As the name indicates, it is designed to study ocean topography and surface water on the continents. SWOT comprises both an oceanography and a hydrology mission. 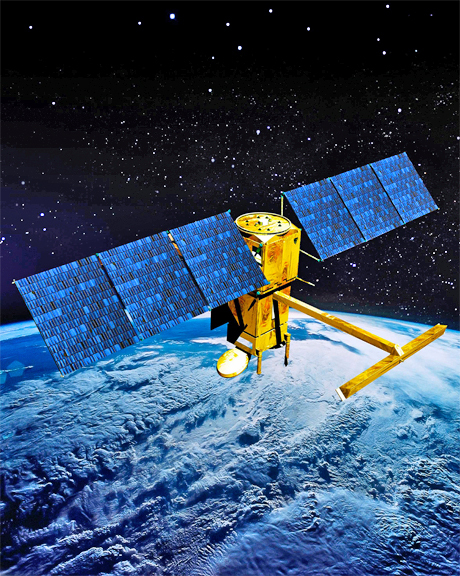 For oceanography, the satellite will provide measurements of ocean surface and wave height with higher resolution than its predecessor Jason satellites. This data will be used to analyze and understand the effects of coastal circulation on marine life, ecosystems, water quality and energy transfers, resulting in more accurate models of the interactions between oceans and the atmosphere. The hydrology mission will evaluate continental surface water, to study changes in water storage in humid zones, lakes and reservoirs, as well as flow rates in rivers. Thales Alenia Space will develop a new-generation platform for the SWOT satellite, offering, for the first time, a controlled atmospheric reentry of the satellite at end-of-life, in line with the French Space Operations Act. The company will also handle satellite assembly, integration and testing (AIT), delivery to the launch center, and operations for the launch campaign. The SWOT payload comprises two subassemblies, KaRIn and NADIR. Built by JPL, KaRIn (Ka-band Radar INterferometer) comprises two Ka-band antennas, located 10 meters apart but precisely positioned in relation to each other. It offers two-dimensional observation capability over a 120-kilometer swath, with horizontal resolution of 50-100 meters, programmable on either side. The interferometry type altimeter will provide coverage of lakes, rivers, reservoirs and oceans, at a repeat rate of twice every 21 days. Thales Alenia Space is also offering to supply the RFU (Radio Frequency Unit), which is at the heart of this instrument. The NADIR module comprises the same instruments as on the Jason satellites, including the Poseidon dual-frequency altimeter made by Thales Alenia Space. It also includes the Thales-built Doris system for precision orbital determination, an AMR (Advanced Microwave Radiometer), the GPSP (GPS Payload) and the LRA (Laser Retro-reflector Array) built by JPL. Weighing about 2 metric tons at launch, SWOT will be placed into orbit at an altitude of 890 km, with an inclination of 77.6 degrees. Compatible with the Antares, Falcon 9 and Atlas V launchers, it is expected to be launched in 2020 for a demonstration mission lasting about three years. Hervé Hamy, Vice President for Observation and Sciences at Thales Alenia Space France, said, "SWOT will be the very first satellite to offer controlled reentry, and will also incorporate new-generation avionics that perfectly match CNES's new ISIS standard. Winning this new contract paves the way for our product policy to include swath altimetry, and bolsters Thales Alenia Space's world leadership in space altimetry." The Thales Alenia Space infosite may be accessed at https://www.thalesgroup.com/en/worldwide/space for further information.